If you’re a stompbox fan, it’s hard not to be bowled over by the creative releases from EarthQuaker Devices. Since 2004, the firm (started by former Black Keys road manger Jamie Stillman) has been building guitar effect pedals entirely by hand in lovely Akron, Ohio USA. With a product line that is the equivalent of a stompbox candy store, EarthQuaker’s impressive line of killer fuzz and distortion boxes has morphed into a multi-headed Hydra-beast that seems to now turn out new sound-manipulation tools faster than Apple cranks out iThingys! These days, EarthQuaker’s irreverence and sonic adventurism finds the company as willing to toy with analog circuits for purists, as DSP pedals for bold experimentalists, all at the same time as carving out an enviable position in the boutique pedal market while building a legion of fans. 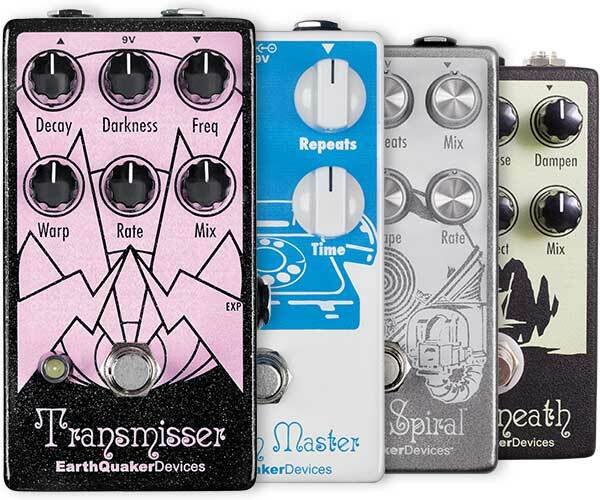 From their line of Reverb and Delay pedals, to quirky modulation boxes and all the way through to some of the best drives, distortions and fuzzes on the market, EarthQuaker Devices will certainly let your creative juices flow. EarthQuaker Devices are the brains behind some of the most stunningly unique ambient devices currently on the market. From the lush all-purpose delay and reverb of their top-selling Dispatch Master and Avalanche Run to the magical cavernous depths of the Afterneath Reverb. You can also go deep into outer space with the modulated interstellar tones of the Transmisser Reverberator or jump in the figurative Delorean and travel back in time to the old and murky tape-delay tones of the Space Spiral Delay or the splashy spring-tank ambience of the Levitation Reverb. No matter what you need, EarthQuaker Devices have made sure that there’s a tool for every musician out there to put at the end of their signal chain. You feel modulation is passé? That it has been done to death? Well, just wait until you plug into the wild and wonderful world of modulation by EarthQuaker Devices. From the outrageous pitch-modulation of their iconic Rainbow Machine, to the lush waves of their Sea Machine Chorus and the pulsating swirls of The Depths Vibe, and all the way to the stunningly versatile harmonic tremolo of the Night Wire, the synthy arpeggios of the Arpanoid and the funky filter sweeps plus robotic sampling of the Spatial Delivery. EarthQuaker Devices are the mad modulation scientists that will make you want to unabashedly drench your entire signal in modulation again, as if the 80s had never existed! Dirt is where the heart is for EarthQuaker Devices. 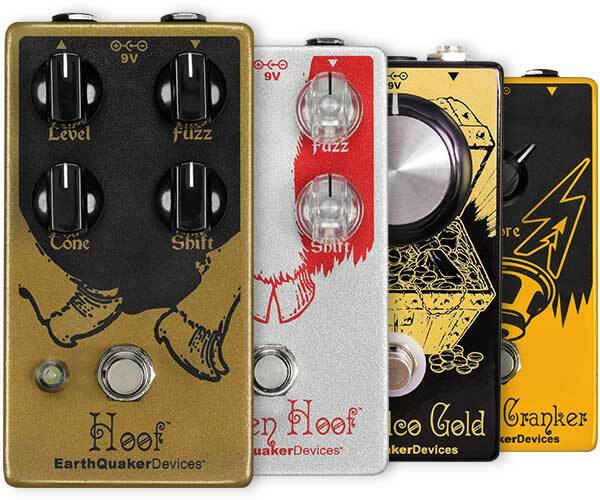 The company was basically founded on fuzz as the now legendary Hoof Fuzz was the first commercially available product from Jamie Stillman’s hands, and to this day the company still stands as guaranteed provider of the best distortion devices on the market. From the Hoof Fuzz legacy has sprung a divine selection of dirt pedals. From simple one-dial pedals such as the roaring power-amp distortion of the Acapulco Gold, the crunchy drive of the Speaker Cranker or the doomy fuzz of the Erupter, to versatile sonic sledgehammers such as the Tubescreamer smorgasbord served by the Palisades, the wild and wide-ranging distorted tones of the Gray Channel to the broken brother of the Hoof, the Cloven Hoof. No matter what your dirty desires might be, EarthQuaker Devices is sure to have a pedal that fits your bill. 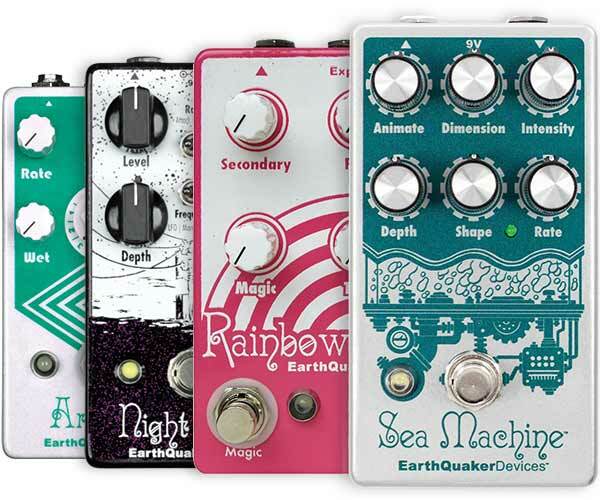 Audio Distribution Group is proud be to be responsible for sales management in the UK, Scandinavia and Italy for EarthQuaker Devices and are pleased to help support and bring the brand to these markets under our Strategic Alliance with Filling Distribution.